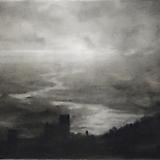 Bell’s paintings and intimate, diminutive charcoal drawings (some of which measure as small as 2 x 4 inches) bring to mind 19th-century American painters Albert Pinkham Ryder, R. A. Blakelock, Frederick Church, as well as England’s John Constable. Exacting and deliberate, often mysterious impressions of nature's disquieting, transitory presence, her works comprise a vision of nature that sweeps across vast plains and valleys, ascends into lofty skies, and reaches toward far distant horizons,… The vision often pictures nature at dawn or dusk, its light generally dimmed and pale or momentarily darkened by clouds, its expanse sometimes broken only by a first or last glimpse of the flashing sun, its temper otherwise solemn, even troubled, as if brooding. As Bell has remarked: “Infinitely complex, at once undefended and harsh, welcoming and seemingly impenetrable, this forested, watery place continually shows me the inescapable vulnerability and unknowable forces that inform it, and by extension, us. Belz, Carl. 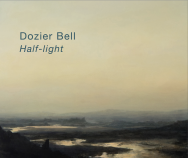 “Dozier Bell’s Drawings,” Left Bank Art Blog, February 20, 2014. Bell, Dozier. Dozier Bell: Recent Paintings and Drawings. New York: Danese/Corey, 2014.